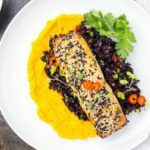 This Honey Sesame Salmon is easy to prepare and packed with flavor! 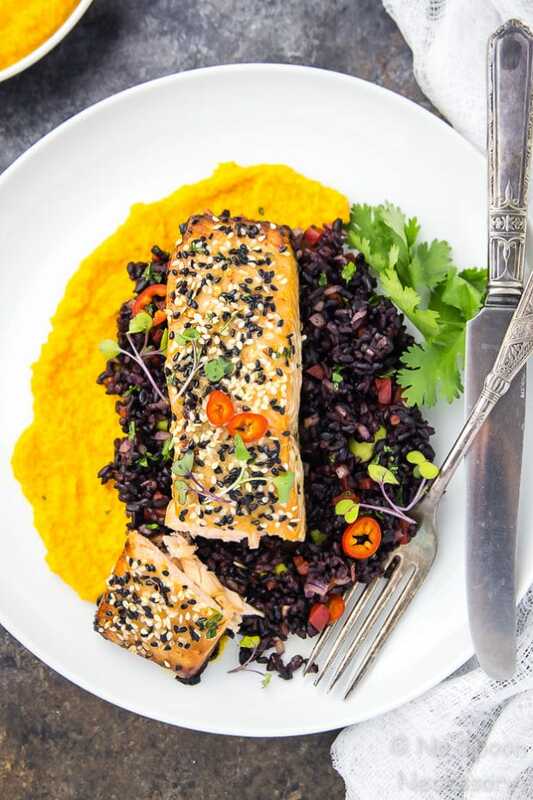 Served over an Asian black rice salad studded with edamame, red bell peppers, red onions and cilantro, and finished with a silky smooth carrot-ginger sauce, this meal is healthy, yet guaranteed to please! 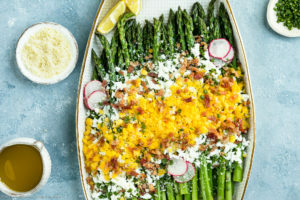 Truth – I didn’t even realize that I spend approximately 99.98% of my life eating clean until, ohhhhh, about 5 seconds ago when I did a thorough google search of ‘clean eating’. To be honest, I probably spend 73.76% of my life eating paleo and 42.01% adhering to a whole foods diet. But, all the rubrics and rules regulating those ‘lifestyles’ confuse me. That is why you never find me labeling meals as such on this here site. I would definitely require a personal assistant, or life coach, to make those life altering, and labeling, decisions for me. And that is just not in the budget. So I totally feel like we should take a moment and applauded the fact that I DID look up all the ingredients in this dish to make sure it’s clean. And, it’s SQUEAKY clean, y’all. I’m talking, cleaner than your church shoes type of clean. 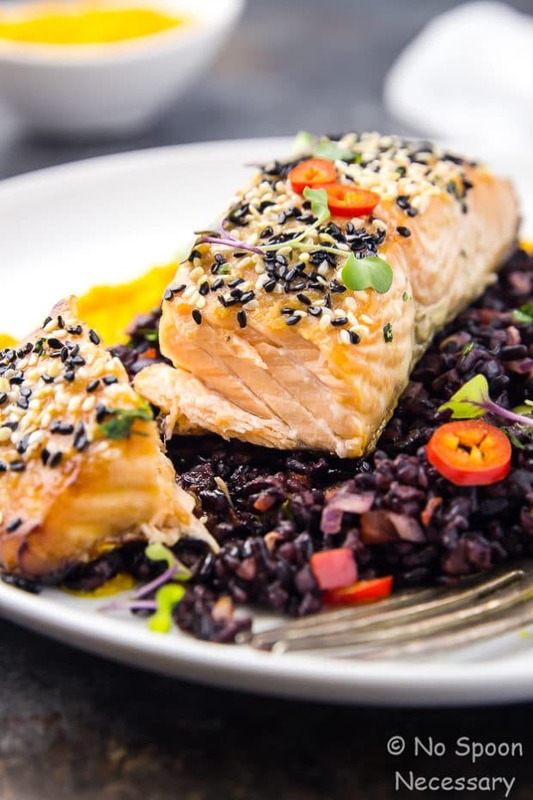 Luscious, tender, flaky salmon smothered with a sweet honey sauce and generously sprinkled with sesame seeds. 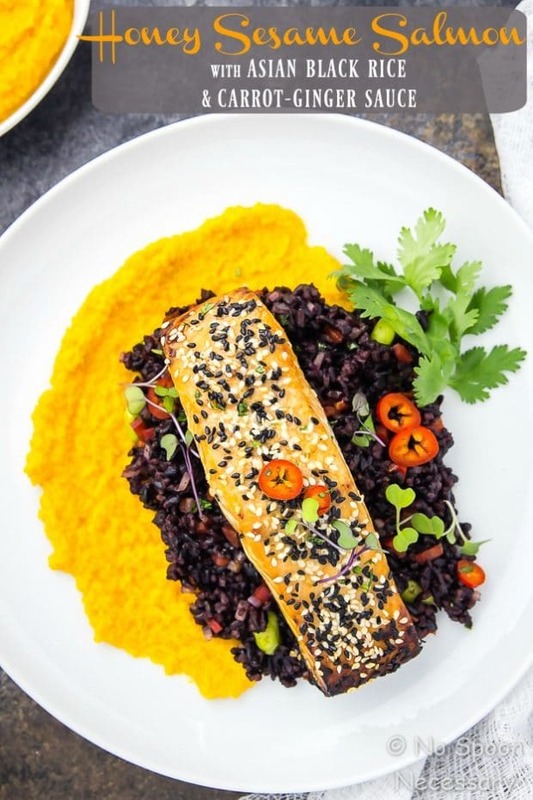 Served over fluffy, nutty forbidden black rice, studded with soft edamame beans, sweet red bell pepper, pungent red onions and herbaceous cilantro. Topped with a rich, silky, smooth, naturally sweet, umami packed sauce spiked with carrots, miso and ginger. If this dish had a theme song, it would definitely be ‘too legit to quit’. ⬆️ I know, I know. I’m all over the place today with my genres of music. Truth bomb  – this dish is a three part-er. I’m not a magician, and in all honesty, the instant pot couldn’t even make this dish in one fell swoop. Or three swoops for that matter. And clearly I am not as wizardly as the instant pot. Hold up! Don’t run away! 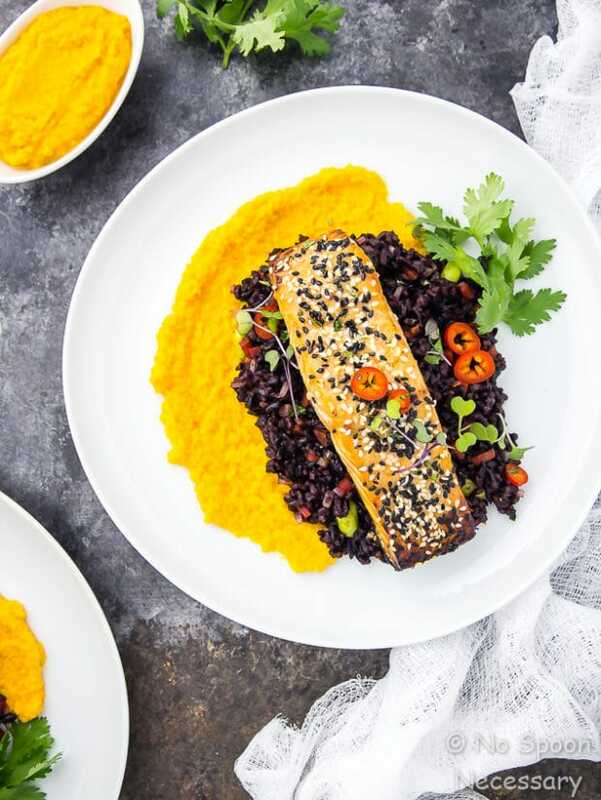 The three steps are preposterously easy and totally worth the whole shebang of salmon INSANITY that is sure to blow your mind. Step two. Make the carrot-ginger sauce. 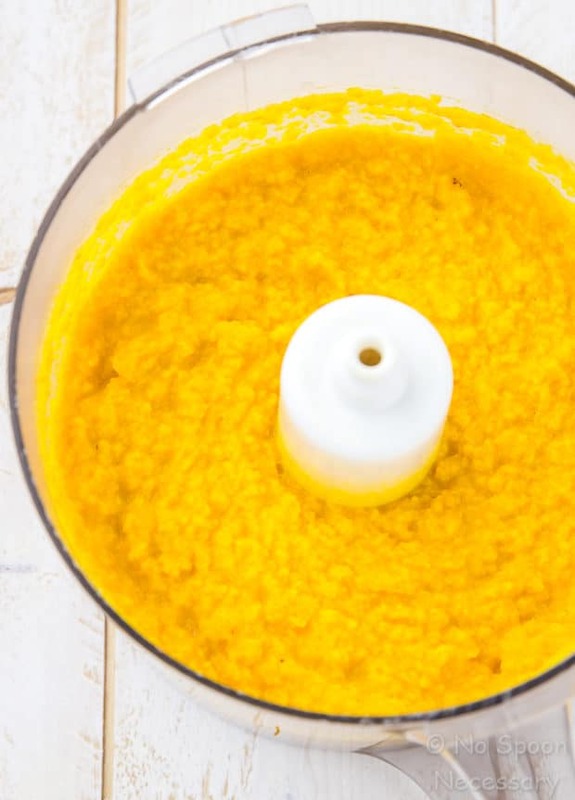 Add some carrots and ginger to the bowl of a food processor and pulse away. Add in some miso, a splash of rice vinegar and a drizzle of sesame oil, then blend it up. With the processor running, slowly add in the oil and process until everything is silky smooth. Step three. Bake. 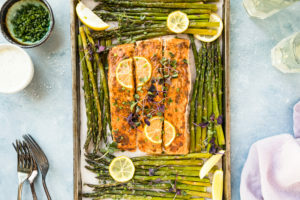 Remove the salmon from the marinade, transfer it to a baking dish, sprinkle it with sesame seeds and bake until opaque and cooked to your liking. 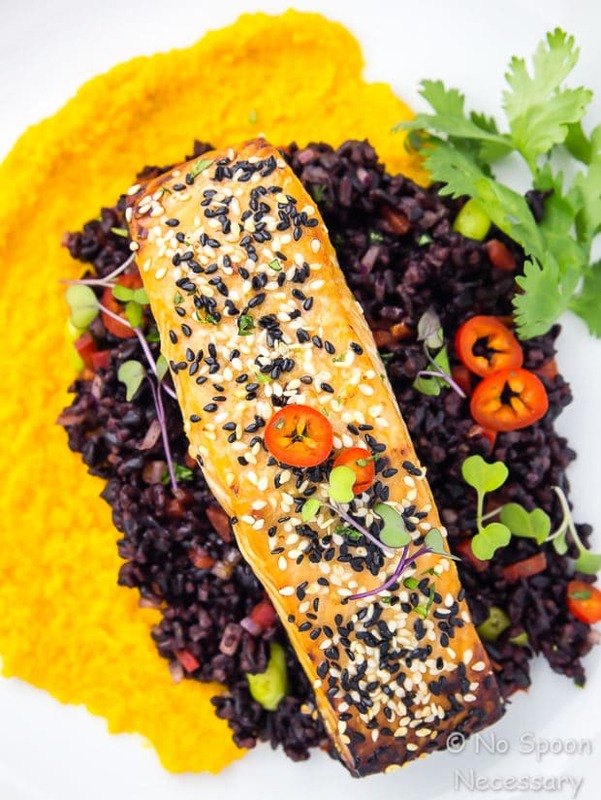 Grab a plate and pile on the black rice. Top it with all the veggie fixin’s. Generously dollop the carrot-ginger sauce ALL over the plate…and then drizzle some in your mouth (because it’s that good). For the most flavor, marinate the salmon overnight. If you’re pressed for time you can get away with marinating it as little as 30 minutes, but it obviously won’t be as packed with flavor. 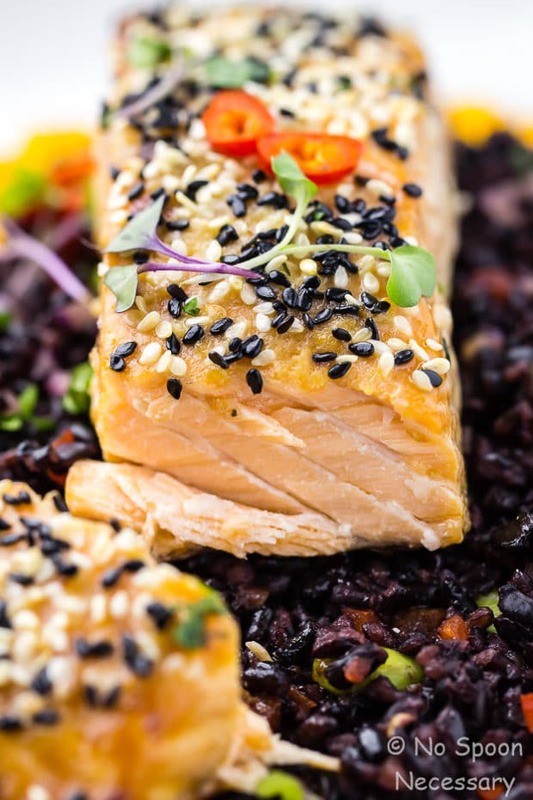 You can use either black, white or a combination of sesame seeds for the honey sesame salmon. I used a combination for aesthetic purposes only. The carrot-ginger sauce uses sweet miso. I’ve seen it as labeled as white miso or ‘shiro’ miso, but if you aren’t sure, just look for the word ‘sweet’. Make sure you use a neutral flavored oil in the carrot-ginger sauce! Grapeseed, corn, canola or vegetable oil are all fine. If you use a flavored or scented oil such as olive oil, it will overpower the other ingredients. 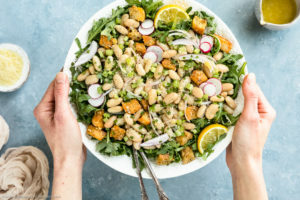 If you want a sauce that is thinner, and more dressing-like in consistency, simply add in more oil (with the processor running), one tablespoon at a time, until desired consistency is achieved. The amount of time the honey sesame salmon needs to bake will depend on the thickness of your salmon and your desired level of done-ness. 12-15 minutes as indicated in the recipe is an approximation. If you want a crispier top on your salmon, switch the oven to high broil during the last minute or two of baking. Just make sure you keep a VERY CLOSE eye on it to avoid burning! 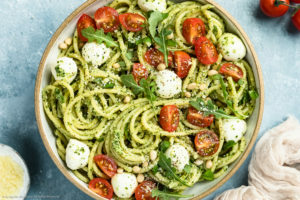 Healthy eating doesn’t have to be boring or bland! 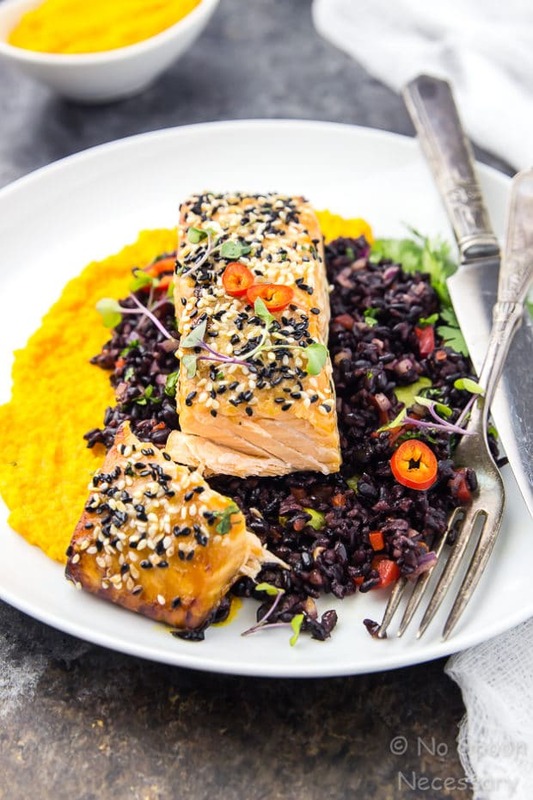 Add this Honey Sesame Salmon & Asian Black Rice Salad to your fit and fabulous food line up! Until Thursday friends, cheers – to livin’ that clean life. 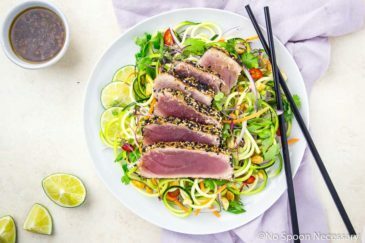 Marinate the Salmon: In a small bowl whisk together the sesame oil, honey, soy sauce, garlic and crushed red pepper flakes. 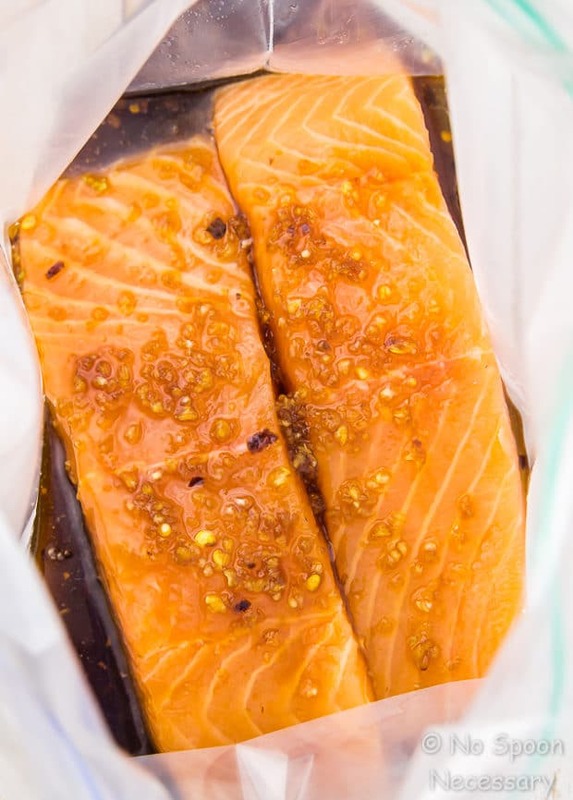 Place the salmon filets in a large Ziploc bag and pour the marinade over the salmon, turning to coat. Seal the bag and refrigerate for at least 30 minutes, or up to overnight. Meanwhile make the Dressing*: Add the carrots and ginger to the bowl of a food processor. Pulse until finely chopped. Add in the remaining ingredients, except the oil and blend pureed, stopping to scrape down the sides of the bowl as needed. With the motor running, slowly stream in the oil, and process until smooth*. Preheat the oven to 400 degrees F. Line a baking sheet with aluminum foil for easy clean up. 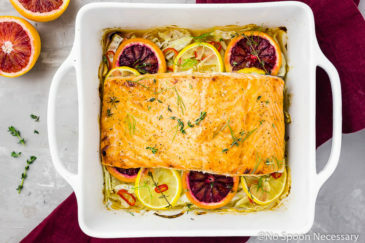 Bake the Salmon: Remove the salmon from the marinade and transfer the salmon, skin side down, to the prepared baking sheet. Sprinkle the tops of the salmon with sesame seeds and season generously with salt and pepper. Transfer the baking sheet to the oven and bake for 12-15 minutes depending on thickness, or until opaque. Optional: for salmon with a crispier top, broil the salmon on high for the last 2 minutes of baking. Just make sure you watch the salmon VERY closely to avoid burning. To serve: Spread some of the dressing on serving plates. Top with rice, veggies, salmon and optional garnishes. Enjoy! 1. For the most flavor, marinate the salmon overnight. If you’re pressed for time you can get away with marinating it as little as 30 minutes, but it obviously won’t be as packed with flavor. 2. 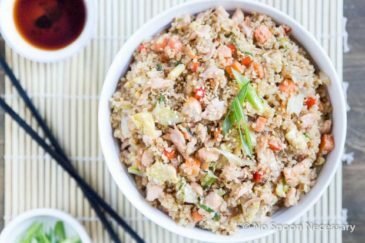 You can use either black, white or a combination of sesame seeds for the salmon. I used a combination for aesthetic purposes only. 3.The carrot-ginger sauce uses sweet miso. I’ve seen it as labeled as white miso or ‘shiro’ miso, but if you aren’t sure, just look for the word 'sweet'. 4. Make sure you use a neutral flavored oil in the carrot-ginger sauce! Grapeseed, corn, canola or vegetable oil are all fine. If you use a flavored or scented oil such as olive oil, it will overpower the other ingredients. 5. 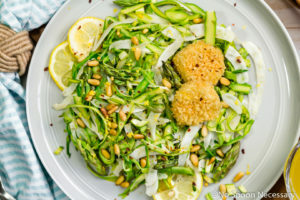 If you want a sauce that is thinner, and more dressing-like in consistency, simply add in more oil (with the processor running), one tablespoon at a time, until desired consistency is achieved. 6. 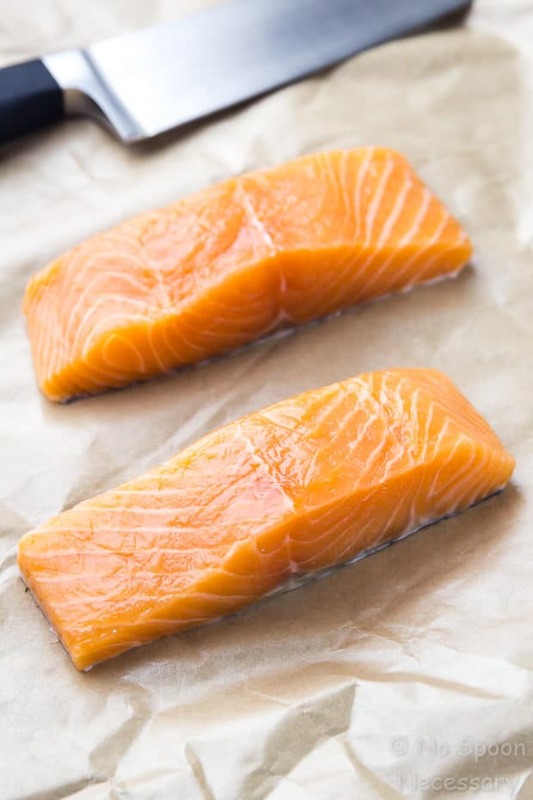 The amount of time the salmon needs to bake will depend on the thickness of your salmon and your desired level of doneness. 12-15 minutes as indicated in the recipe is an approximation. 7. If you want a crispier top on your salmon, switch the oven to high broil during the last minute or two of baking. Just make sure you keep a VERY CLOSE eye on it to avoid burning! **Nutritional Facts include everything! The salmon, rice and sauce. Simply delicious, Cheyanne! I was looking for a sauce like this one that I can use for fish! Oy my word! Cheyanne – I don’t know where to start! THAT salmon! THAT Asian Black Rice Salad or THAT Carrot-Ginger Sauce!!! But wait, no “or” needed cos you have ands all around! What a treat! That carrot ginger sauce grabbed my attention and like you mentioned – POW! I’m hit with all kinds of healthy flavas. Looks amazing! I love all of the elements of this meal, but especially the carrot ginger sauce! And it’s so pretty! Beautiful photos, beautiful plating, and super exotic looking dish. I am also in love with the name fo this black rice salad, Cheyanne. And that carrot ginger sauce so flavorful. I love carrot ginger chutney so I can tell I am gonna love this. Have a lovely week my friend. I like your style! I have a hard time with the “labels” too as my daily diet doesn’t adhere to any one diet or way of eating! Eat mostly healthy and all in moderation right? Also, I love the DMX reference. I am guilty of blasting that song in the car occasionally when I’m kid-free (don’t tell anyone). 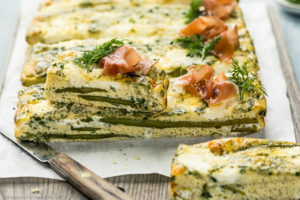 I never really know what to do with salmon so I’m loving this new recipe! Good one!! Cheers! haha oh this made me chuckle! I can barely keep up with all the different diets for everything! I feel like a new something or other comes out every day! But anyway, I am still a bit afraid of cooking salmon myself since it is a new enjoyment for me … buttttttt I should probably learn instead of spending so much money at one restaurant haha This sounds deeelicious!! Silent golf clapping Lol!! Yes I am!!! I’m right there with you, I don’t have the time or the energy to figure out how to label food…nor do I really desire to. I like to just live and keep it all in balance and keep it under the umbrella of ‘food that feeds my soul’ 😀 This carrot ginger sauce reminds me of a salad dressing that our local sushi place serves that is TO DIE FOR!!!! I’ll have to try this on salmon. YUM idea friend!!! 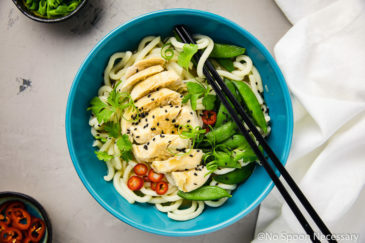 The flavors and colors in this dish is why I love cleaning eating so dang much!